Last month, Dodge felt rested and restless. It was time to do something. She worked as a private chef and on her pastry and bread recipes. One day, Dodge posted on social media about how much she hated her home oven, which runs 100 degrees hotter, and Cora Cotrim, the owner of Queen of Cream, offered hers since it sits unused most of the time. That was the spark for Dodge’s “Bread is Good” pop-up. Why the name? “I hate that bread gets demonized so I want it to be the highlight,” Dodge told me. Paris served as an inspiration for some items on Dodge’s pop-up menu. The winter greens salad topped with a soft-boiled egg, prosciutto, seeds, and creamy dressing is influenced by a meal Dodge had at Buvette, a wine bar in Paris. The same greens accompany the “Egg in a Frame,” her take on the classic toad in the hole, which uses her crusty sourdough bread and is finished with two crisp slices of bacon. The sourdough appears in other dishes, such as a tartine of sliced smoked salmon nestled into clouds of cream cheese showered with shaved red onion, capers, and dill. Crackly loaves of the sourdough, speckled with char marks, are also for sale should you want to spin it into your own breakfast at home. Fans of Dodge’s biscuits and cinnamon rolls at 8Arm will rejoice that they are available here and are mostly unchanged. 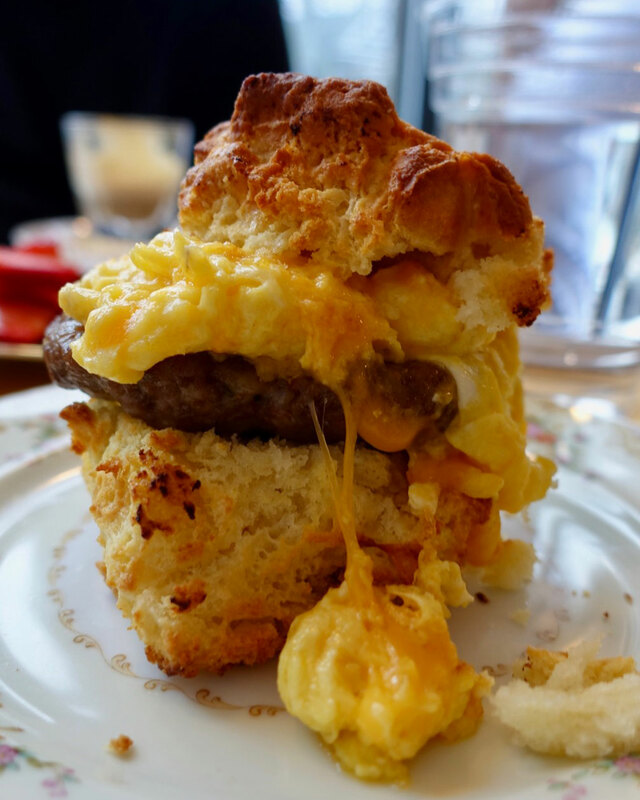 The buttery and crumbly biscuit is served with sausage, scrambled egg, and melted cheddar cheese; add grape jam or substitute bacon for $1. Slightly sweet brioche is the foundation for two French toasts—one sweet, the other savory. The former is covered in cinnamon and served with sliced strawberries so fragrant you’d swear it’s summer; get it topped with some Queen of Cream ice cream for the ultimate mashup. The latter is served with a caramelized onion broth, microgreens, and a fried egg. If you, like me, want to eat as much of this soul-warming food as possible, a good strategy is to eat the hot dishes here and take the baked goods home. Over the next two weeks, Dodge will travel to Cumberland Island and cook with chef Whitney Otawka at the Greyfield Inn before resuming her pop-up. In the meantime, Schneider and Sheldon will take over the kitchen February 24 and 25 with a Mexican-themed breakfast pop-up within a breakfast pop-up. Think chorizo and green egg biscuits, breakfast tacos, and some type of corn cake. Schneider says they’re also playing around with Scandinavian and Korean breakfast ideas. Dodge says that when she returns she plans to keep the pop-up going through March. “I want to provide things that are fun and make you leave with a smile on your face,” Dodge says. It’s hard not to smile here—not only at Dodge’s talent but also at Brown’s legacy. 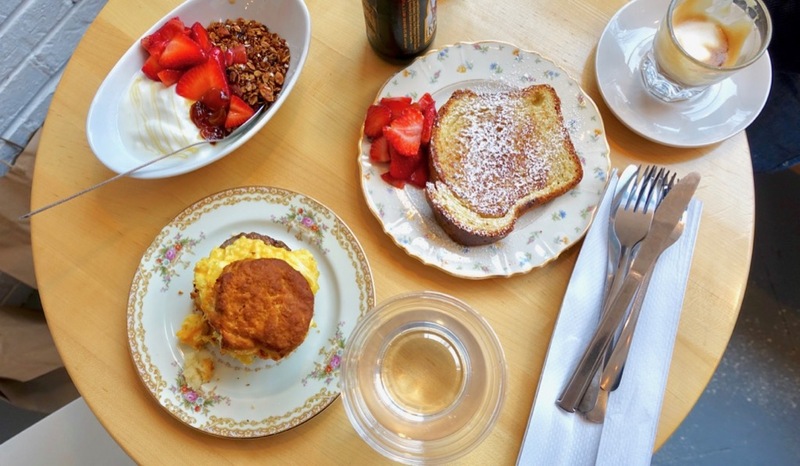 Starting next week (they’re taking this weekend off), Bread is Good will be open at Queen of Cream Saturdays and Sundays from 9 a.m. to 2 p.m. or until the food runs out. 701 Highland Avenue, 404-331-0807.